Second Chance Homes and Yellowstone County Family Drug Treatment Court hosted their second annual joint Christmas party last Friday at Friendship House. The party is a wonderful celebration of the progress that each family has made with help from these two organizations. Both active clients and graduates are invited to share in the festivities. The children were fascinated by the karaoke machine. Many of them were amazed to hear their voices boom over the speakers. We also set up craft tables for clients and their children to make play dough ornaments, paper bag puppets, reindeer food, reindeer clothespins, and decorate their very own cookies! We had wonderful volunteers heading up the tables. One volunteer actually made play dough from scratch! 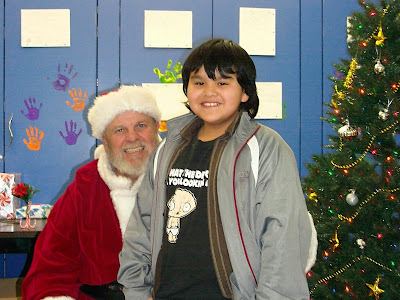 Santa made a special stop at Friendship House to distribute gifts to all of the children. Each child got his/her picture taken with jolly old Saint Nick! After a night filled with pizza, laughter, sugar and family, everyone left the party very exhausted but with lifted spirit.